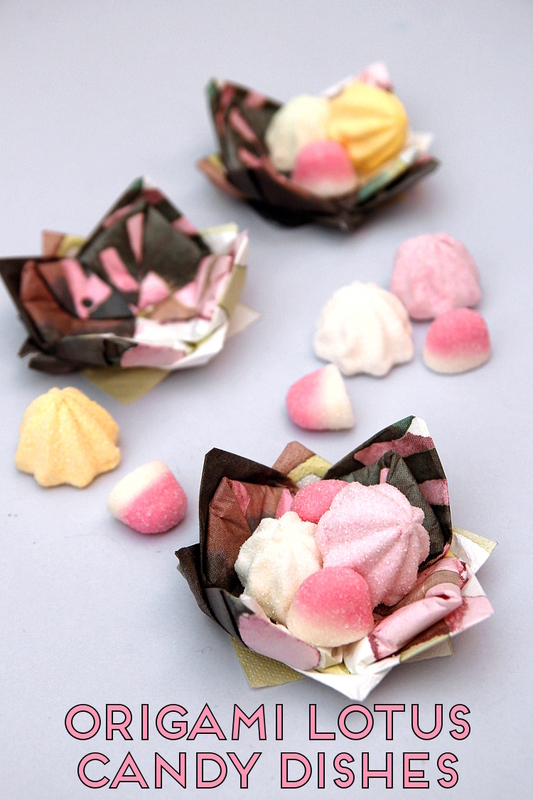 I'm crazy about these origami lotus candy dishes. If you've got a party planned or a special occasion this Summer I think they'd be perfect way to display your treats or nibbles. Put popcorn in the them for a movie night or sugared almonds at a wedding and you've got a pretty table decoration that only cost pence to make. SUPPLIES: Paper napkins and A Glass. 1. Take your napkin and lay it out flat with the pattern side down. If your napkin has several plys make sure to remove a couple of layers, any more than 2 and they can be difficult to fold. 2. Take the 4 corners and fold them into the center. 3. Repeat the step above and fold the corners into the center another 2 times (so 3 altogether). 4. Flip your napkin over and fold the corners into the center one last time. 5. Flip it over again and place your folded napkin on top of a glass. Keep your finger pressed down in the center to stop it popping open. 6. To make the 1st layer of petals carefully fold the top 4 points back out. using the glass as a mould. 7. Repeat and peel back the next layer to make the middle row of petals. 8. Peel back the final layer to make the base petals. This layer is the trickiest as the napkin can tear easily so try to be careful. 9. Remove your napkin from the glass mould and flip over to reveal your origami lotus flower dish. 10. Fill with candy or snacks and serve. Pretty, practical and quick to make, what's not to love? I'm sure you'll wow your guests with a couple of these dotted around your party table. Pretty, practical and quick to make, what's not to love? P.S. Want more? You can find my other origami crafts here.